Morgan Lamri is outraged after the Tennis Integrity Unit (TIU) punished him over corruption allegations. The 22-year-old Frenchman has become the first tennis umpire to receive a ban for match fixing. Lamri has been found guilty of betting on tennis and efforts to influence the results of matches. The Tennis Integrity Unit handed out a lifetime ban to the French tennis official. Lamri admitted he had placed bets on tennis events, but only on those he didn’t referee. The 22-year-old likes sports betting but only as a hobby. A spokesperson for the Tennis Integrity Unit revealed that the breaches took place in 2012 and 2013. However, Lamri categorically denies his involvement in any case of match fixing. 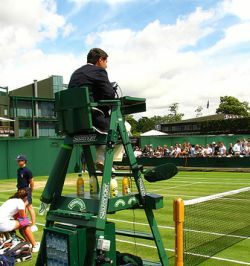 Additionally, the 22-year-old tennis official claims that the TIU failed to provide rigging evidence against him. “It’s bizarre that they banned me without any hearing”, Lamri commented. The Frenchman refused to cooperate with TIU’s probe into the allegations. The Tennis Integrity Unit claims that Lamri approached players during futures tournaments in an attempt to influence the outcome of those events. “They are my colleagues, and sometimes we enjoyed a lunch together. But I never tried to rig matches”, Lamri added.